Claire McCardell was one of the most influential women's sportswear designers of the twentieth century. 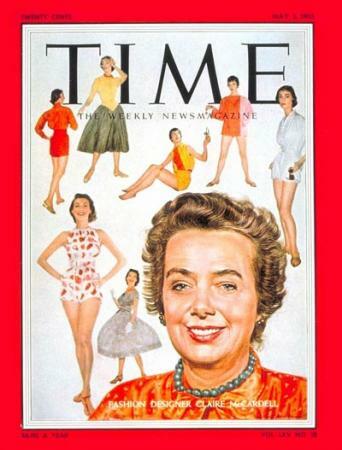 Best known for her contributions to the "American look," she was inspired by the active lifestyle of American women. Known for casual sportswear, shirtwaist dresses, and wool jersey sheaths, as well as practical leisure clothing and swimwear, which she liked to refer to as "playclothes," McCardell designed for working women who wanted stylish, well-made clothing in washable fabrics that were easily cared for. McCardell was born in Frederick, Maryland, in 1905, where she attended Hood College for two years in the mid-1920s before earning a degree in fashion design at the Parsons School of Design in New York City in 1928. In the course of her studies she spent one year in Paris. Working after graduation as a fit model for B. Altman and Company, McCardell later obtained a job as a salesperson and design assistant with Emmet Joyce, an exclusive, made-to-order salon on Fifth Avenue. Within a matter of months, she was lured away by the knitwear manufacturer Sol Pollack to design and oversee his Seventh Avenue cutting room, where she stayed for less than a year. By late 1929 McCardell was working as a design assistant to Robert Turk, an independent designer and dressmaker, who later took her along with him when he was employed as chief designer at Townley Frocks in the early 1930s. Turk died unexpectedly in a boating accident in 1932, and McCardell was promoted to chief designer at Townley. McCardell remained with Townley throughout her career, with the exception of a brief hiatus in the early 1940s, and eventually became a partner. During the time that Townley's partners restructured their business, McCardell worked at Hattie Carnegie; however, Townley soon rehired her as their head designer. While most of McCardell's contemporaries followed the long-standing tradition of copying Paris fashion, McCardell looked instead to the lives of American women for her inspiration. Insisting that "clothes should be useful," McCardell became one of the first designers to successfully translate high-styled, reasonably priced, impeccably cut clothing into the mass-production arena. Proudly American and rebelliously innovative, McCardell (who, as a student in Paris, had admired the work of Vionnet, Chanel, and Madame Grès) turned her back on the expensive, handmade confections of the haute couture and instead promoted American mass production, readily available materials, and the form-follows-function approach to design. Insisting that heavily decorated, padded, and corseted French fashions often sacrificed comfort to style, McCardell designed clean-lined, comfortable clothes that proved such a sacrifice was not only unacceptable; it was also unnecessary. The retail magnate Stanley Marcus once described McCardell as "the master of the line, never a slave to the sequins … one of the few truly creative designers this country has ever produced." Shunning shoulder pads, back zippers, boning, and heavily constructed looks, McCardell became known for her self-tailoring, wrap-and-tie styles, backless halters, hook-and-eye closures, coordinated separates, racy bathing suits, and boldly printed, cotton plaid, shirtwaist dresses cut from men's shirting fabrics. Often referred to as "America's most American designer," McCardell's fresh, youthful designs were founded on logic, informed by comfort, and replete with a common sense, entirely undecorated look. As the veteran fashion model Suzy Parker once described them, McCardell's designs were "refreshingly 'unFrench.'" McCardell's first commercial hit came in 1938 with the "Monastic" dress, an unfitted, waistless shift, cut on the bias, that hung straight from the waist and was belted in any way the wearer chose. The Monastic was so resoundingly popular that it was copied by competitors into the next decade and remained in her own line in updated versions for almost twenty years. Another McCardell success story was "capsule dressing," or four- and five-piece, mix-and-match separates groups in supple wool jersey, cotton, denim, and even taffeta. These stylish, well-edited groupings offered women a convenient travel wardrobe that sold altogether for about one hundred dollars and could be tucked into a handbag. An avid champion of pants and wool jersey for both day and evening wear, McCardell's forward-looking designs and fabric sensibility provided American women with multiseasonal clothing that was easily cared for, comfortable, and stylish, but never conspicuously chic. McCardell's pared-down, casual American style was the hallmark of what came to be hailed as the "American look," the name under which the work of McCardell and several of her like-minded contemporaries, such as Tina Leser and Tom Brigance, was marketed at Lord and Taylor during the late 1930s and early 1940s. During World War II, McCardell's designs earned further credibility, as they reflected an acute awareness of the evolving roles of mid-century American women. Offering sportswear and daywear that were at once appropriate for the office, cocktail hour, and leisure, McCardell eliminated the fuss, decoration, and strict categorization so often encountered in women's apparel of the time. Answering practical needs, McCardell's 1942 blue denim "Popover" dress, which sold for only $6.95, was made specifically for at-home domestic work or gardening and even included an attached oven mitt. True to her problem-solving approach to fashion design, McCardell used humble fabrics such as cotton calico, denim, jersey, and even synthetics, effectively ennobling everyday materials by way of thoughtful design and deftly executed construction. And while restrained and disciplined, McCardell's work was hardly devoid of details: Her signature, even idiosyncratic, "McCardellisms" included severe, asymmetrical, wrap necklines, yards-long sashes, spaghetti-string ties, double-needle top stitching, metal hook-and-eye closures, and even studded leather cuffs. With their sleek lines and "no-price look," McCardell's clothes became a mainstay in the wardrobe of college girls, working women, and housewives alike. Claire McCardell achieved international fame during her lifetime, appearing on the cover of Time magazine and authoring a book on her fashion philosophy, What Shall I Wear? in 1957. In 1943 she married the architect Irving Drought Harris. McCardell was diagnosed with cancer in 1958, at the height of her success. The disease claimed her life that same year. 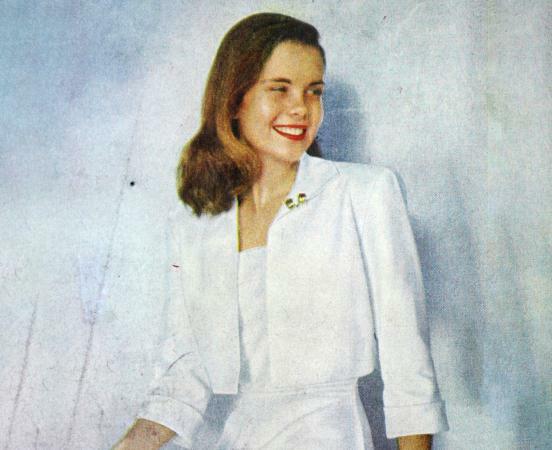 Looking at her own life as a starting point for her line, McCardell's casually elegant, pared-down minimalism and lifestyle-driven sportswear of the late 1930s and 1940s helped forge and define what came to be known as the "American look" and heralded the beginning of a new appreciation for American fashion. As fashion historian Valerie Steele points out in Women of Fashion, "without McCardell it is simply impossible to imagine a Donna Karan, Calvin Klein or a Marc Jacobs." See also Casual Business Dress; Ready-To-Wear; Sportswear. Kirkland, Sally. "Claire McCardell." In American Fashion: The Life and Lines of Adrian, Mainbocher, McCardell, Norell, Trigère. Edited by Sarah Tomerlin Lee for the Fashion Institute of Technology. New York: Quadrangle/New York Times Books, 1975. Claire Mccardell. What Shall I Wear? New York: Simon and Schuster, 1956. Milbank, Caroline Rennolds. New York Fashion: The Evolution of American Style. New York: Abrams, 1989. Steele, Valerie. Women of Fashion: Twentieth Century Designers. New York: Rizzoli International, 1991. Yohannan, Kohle, and Nancy Nolf. Claire McCardell: Redefining Modernism. New York: Harry N. Abrams, 1998.